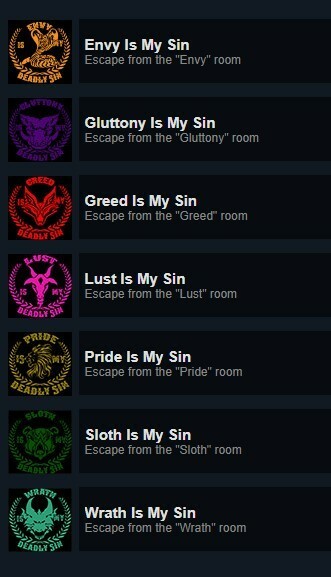 "Forgiveness" is a series of 7 escape room adventures, Take the personality test and find out which sin you are guilty of - the room design, environment and the trials you’ll go through will change accordingly! Positive (24) - 87% of the 24 user reviews for this game are positive. Thank you all for your great feedback! We take them very seriously and try to answer your requests. One request that we got a lot was adding an achievement system. So we are happy to announce It's here! From now on you can share your own personal sin! Show us your support by reviewing the game and send us your feedback. A new update is here! "Forgiveness" is a series of 7 escape room adventures for Windows, Mac or Linux! Take the personality test and find out which sin you are guilty of - the room design, the environment and the trials you’ll go through on your escape to freedom will change accordingly!. Two levels of challenge: Normal and Extreme. The normal difficulty has subtle hints and there is no time limit, but if you want to experience what real punishment is, try to face the challenge by yourself on Extreme mode, with the clock ticking and only 30 minutes left to escape each room! You have lived your life in sin and now you can’t escape the punishment of "God". You wake up, in an unfamiliar room where the enigmatic Dr. Benjamin Smith has trapped you to test your worthiness to stand his judgment ‒ The man believes himself a god and wants to bring his own form of justice to the world. Will you be punished or will you earn Forgiveness? Please don't forget to give us your thoughts and ideas on the game, we are here to improve and we need your help to keep doing what we love!